The new Combi-Care Comfort 38E offers the benefits of great looking and green lawns, dual purpose aerator or scarifier drums means that you can easily change the function of the machine to suit the job in hand. 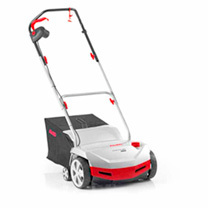 Whether raking out thatch and moss or intensive care, aerating the lawn becomes easy with this durable machine. The new design of the 38E improves further upon the previous 38VLE model with large air intakes for increased airflow and a smooth underbody design to ensure that moss and thatch does not stick to the machine in use. The height-adjustable handlebar allows fatigue-free working and easy operation. In addition, the machine can be stored easily. The roller change does not require tools, so it is simple to change from the scarifier roller with 3-stage steel blades to the lawnrake roller with efficient steel spring tines - complete lawn care in one machine. Five-stage working depth adjustment with just one hand motion. This is important because the blades should just touch the ground when scarifying, in order to avoid wearing them down unnecessarily quickly and to avoid damaging the grass roots.